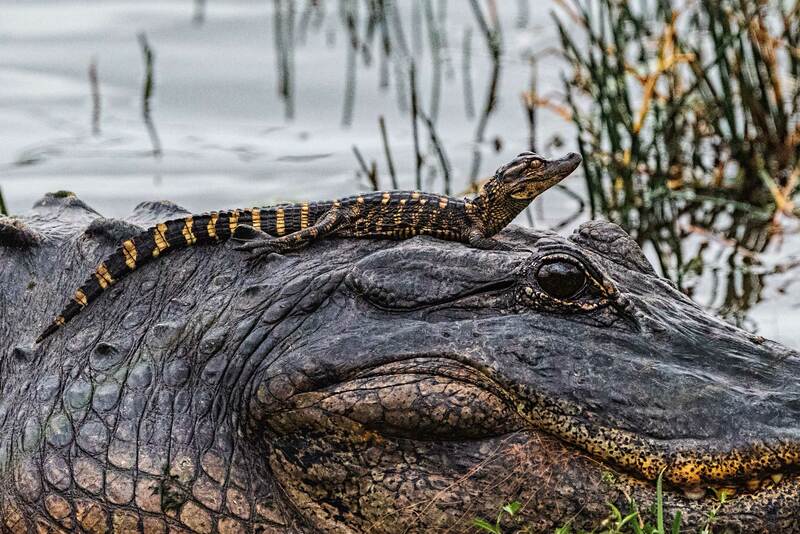 I had incredible luck today, while on Paynes Prairie Preserve State Park, when I was able to photograph a VERY large mother alligator with one of her young gators on her head. I had heard of such gator behavior, but I never imagined I would be able to photograph it. Based on the length of the baby gator (about 12″), I estimate the length of the mother alligator to be over 10 feet. As you can see from the images, she was keeping a close eye on me. I shot the images with a Nikon D810 and 80-400mm lens. Since it was very overcast and the light poor and because I was hand-holding the camera, I shot the images at a high ISO of 2000 to enable shooting at 1/500 sec, f/5.6. Because the D810 produces low noise images at high ISOs, I did not need to apply any noise reduction to the images. 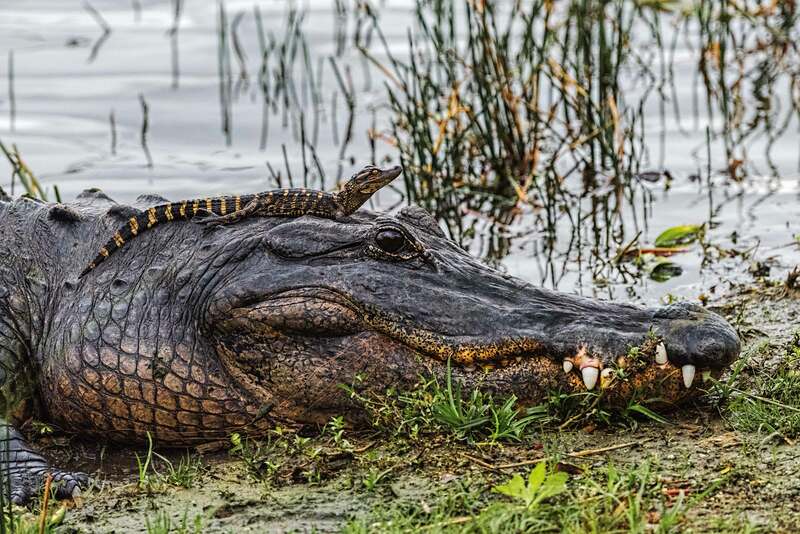 This entry was posted in Nature, Paynes Prairie Preserve State Park, Wildlife and tagged Alligator, American Alligator, Baby Alligator, Payne Prairie Preserve State Park. Bookmark the permalink. WOW! What a great shot! On a day when most photographers would have chosen to stay home, comfortable and dry, you go out and bring home a prize shot! I am really looking forward to joining you this week and hope for more opportunities like this. As always, thanks for sharing your amazing work. My friend who is a Gator (U of F) fan loved it!!! Great shots! Wonderful shot! A happy New Year, Steve! Your pictures came out beautifully! I’ve always hoped to have the opportunity to photograph this. Hoping to get lucky sometime. She is an excellent gator – thanks for sharing! Great photos! How close were you? That mom looks ready to pounce at you!